Doritos are having a bit of a moment right now. They can be found as taco shells, crumbled on the crusts of pizzas, and did you know that they're also available as standalone chips? Crazy. 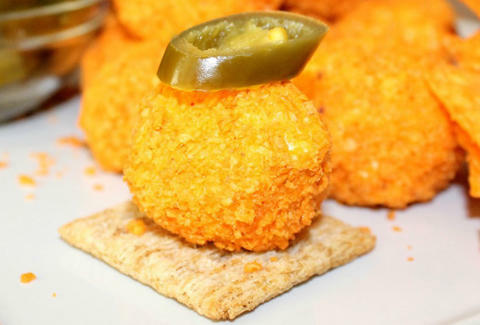 Now, there's a whole new way to use our nation's most versatile chip, and you can make them in the comfort of your own home (provided your home is comfortable): Doritos Cheese Ball Bites, courtesy of Oh, Bite It!. These quintessentially American snacks combine salsa, cream cheese, and shredded cheddar into balls that are then rolled in Doritos crumbs and eaten in the manner of your choosing (i.e. non-stop inhalation). You can get the full recipe here (it's incredibly simple), and proceed to amuse the hell out of your bouche. Adam Lapetina is a Food/Drink staff writer for Thrillist, and plans on doing something similar to these with Flamin' Hot Cheetos. Read his musings at @adamlapetina.